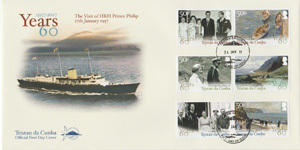 Stamps commemorating 60 years since HRH Prince Philip visited Tristan on the Royal Yacht Britannia on the 17th January 1957. 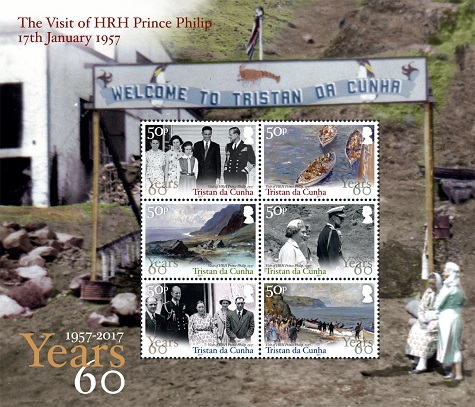 Tristan da Cunha has released a set of 3 se-tenant pairs (50p stamps) and a souvenir sheet to commemorate the 60th Anniversary of the visit of HRH Prince Philip on 17th January 1957 aboard HMY Britannia. The stamps are based on photographs and paintings kindly provided by HRH Prince Philip and the Reverend Bell and taken during the visit. The photographs are paired with paintings by Edward Seago, who was on board the Royal Yacht Britannia. The original paintings are the private property of The Duke of Edinburgh. Photo: The Duke with Sidney and Alice Glass and their daughters Pamela and Trina. Painting: Tristan da Cunha Longboats arrive off RY Britannia. Photo: The Duke followed by Dilys Bell. Painting: Crofter's Cottages - The Tristan Settlement of Edinburgh of the Seven Seas. Photo: The Duke with Head Woman Martha Rogers, her brother Chief Willie Repetto, Administrator Pat and Mrs Forsyth Thompson. Painting: The Duke of Edinburgh departing Tristan da Cunha by longboat. The first day cover illustration shows the Royal Yacht Brittania. The image used as a background on the Souvenir Sheet is from Rev. Philip Bell. There have been only two royal visits to Tristan during the British community's first two hundred years. The first in 1867 was unannounced, as was normal before any wireless communication. So, when the second son of Queen Victoria, HRH Prince Alfred, Duke of Edinburgh and Commander of HMS Galatea, arrived at the island on 5th August, no plans had been made beforehand, everything was organised hastily on the day, which was, however, memorable and resulted in the settlement being named ‘Edinburgh' in the Duke's honour. Ninety years later, on 17th January 1957, HRH Prince Philip, also the Duke of Edinburgh, arrived on the Royal Yacht Britannia during a long journey back from the 1956 Olympic Games held in Melbourne. He visited a thriving Tristan community that had been planning for this great day for many months. Despite recent wet weather, the concrete foundations of the village hall were laid, houses were painted, the roads and the whole village tidied up; ‘welcome archways' and plans made for a full programme. The day dawned sunny and when Britannia was sighted at 9am, five newly painted Tristan longboats were already waiting in the sea off Little Beach in readiness to sail out, taking the Administrator, Pat Forsyth Thompson and Chief Islander, Willie Repetto to welcome Prince Philip to the island. The Island's women and girls gathered in bright printed dresses and head-scarves on the plateau above, whilst on the beach below the men, unusually, wore their dark suits, normally only worn on Sundays, ready to haul the boats ashore. Soon, a flotilla of longboats was seen approaching the shore, the first with Prince Philip at the tiller. As he landed cheers greeted His Royal Highness and on the beach he was presented to the Head Woman, Martha Rogers and expatriate workers. Next Prince Philip toured the factory, which played a pivotal role in the post-war modernisation of the island economy, with the Development Company providing reliable paid work, royalties to fund government projects plus regular shipping for mail, supplies and transit of passengers. At the site of the new hall, speeches of welcome and thanks were made by the Administrator and Chief Islander. The Duke laid the first stone (with a shilling under it for luck) and accepted the gifts from the Island: for the Queen a beautiful model longboat, for Prince Philip, a knitted island wool cardigan and an album of photographs, for Prince Charles, a model boat and bluefish eye marbles, for Princess Anne, a model spinning wheel, and for all of them a pair of colourful island socks. After naming the building "Prince Philip Hall" the weather cleared for visits to the hospital, island store and a display of pedigree cattle, sheep and dogs, as well as of local vegetables. A cheerful football match on the sloping cattle pasture caused much amusement to visitors and ended with the score: Islanders 2 Britannia Crew 2. After tea, the Yacht's band played for an adults' dance, and this time His Royal Highness took part in the pillow dance himself, much to the pleasure of everyone. Finally, the walk back to the boats with Commander Parker wearing the Chaplain's long black cloak and carrying gladioli which the Head Woman presented to the Duke for his cabin. Throughout the day, the Duke's Royal Standard (which he gave to the island) had flown at the new flag-staff in front of the newly named Prince Philip Hall. There was much prior apprehension amongst the community about their important royal visitor, but he proved a most popular guest. All were delighted with his manner and interest, and summed him up with short but apt words: "He was a nice man". The Duke of Edinburgh's visit sixty years ago did not end his association with Tristan da Cunha. He has shown constant interest in island affairs, and has on numerous occasions supported events and publications with letters, for example on the occasion last year of the 200th Anniversary of the island, which we published in the August 2016 Newsletter. He always now receives a Tristan da Cunha Newsletter, and on every occasion his Private Secretary sends the Editor a letter which demonstrates that he enjoys continuing to be informed about island life. The Tristan da Cunha Association was honoured to welcome His Royal Highness to the Dinner held at the Royal Geographical Society in November 2006 to celebrate the quincentenary of the discovery of Tristan da Cunha. During his entertaining speech he recalled that, when at the tiller of the longboat Lorna, he feared that the RY Commodore might hole the canvas with his shooting stick!